Copenhagen, Denmark… 1943 – The Germans occupied Denmark in April 1940. When they attempted to hoist the Nazi flag over Amalienborg Castle, the home of Danish royalty, King Christian X ordered the flag of the Third Reich to be taken down immediately. The king refused to have any flag other than that of Denmark fly over the royal castle. 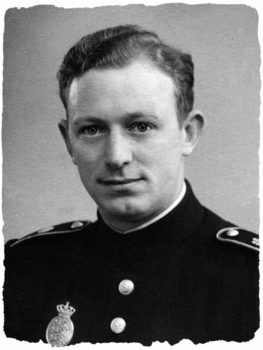 Knud Dyby was a member of the King’s Royal Guard and participated in removing the Nazi flag. After leaving military service, Knud became a police officer and an active member of the Danish underground. As a police officer, Knud had access to information vital to the Danish resistance. He knew the best places to hide near the fishing docks. He knew the patrol routes of the German navy, specifically in the waters between Denmark and Sweden. As an avid sailor, Knud also knew the best sea lanes between Denmark and Sweden. When he learned of Germany’s intention to round up all the Jews in Denmark and to deport them, he acted quickly. He was a member of the Danish-Swedish Refugee Service and participated in the October 1943 rescue of almost 7,200 Jews living in Denmark. Jews were taken by boat across the Øresund, the narrow body of water between Denmark and Sweden. He arranged for hiding places in hospitals where Jews could wait until a boat could be found to take them to Sweden. The information Knud had access to as a policeman proved to be crucial in planning the many crossings that he was responsible for in October 1943. As a member of the Danish underground, he ferried Jews from Denmark to Sweden. Knud assisted in transporting some 1,888 people to safety, a third of whom were Jewish. Knud also managed five fishing skippers. These boats made repeated trips between Denmark and Sweden with mail, money, weapons, intelligence data, news, and Jews. When Denmark was liberated in May 1945, Knud ended his police career. A year later he moved to the United States. Knud Dyby died in September 2011 at the age of 96.